He may very well have been arrogant and stubborn, but Captain William Fraser’s refusal to give in to adversity enabled Royal Brackla distillery to flourish, become the first distillery to gain a Royal Warrant, and ultimately stand the test of time. Iain Russell reports. 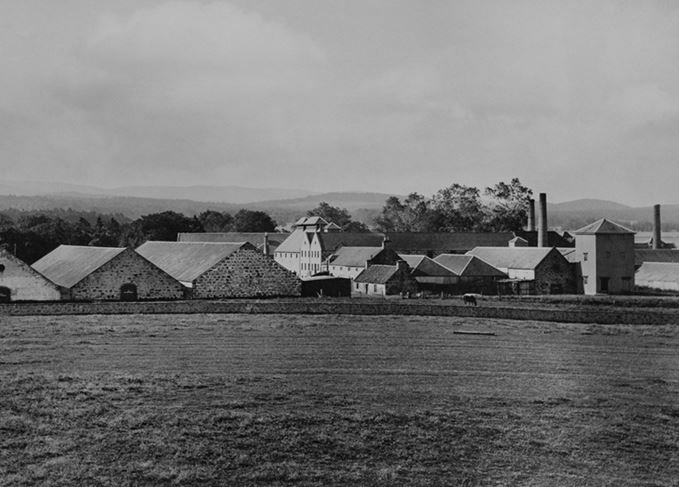 Royal Brackla distillery was founded by the Captain in 1817. According to whisky lore, Captain William Fraser (1767-1846) was an arrant villain. The founder of the Royal Brackla Distillery has gone down in history as aloof, arrogant, spiteful and dishonest. Fraser had earned a reputation for clashing with the Excise authorities and Pavey complained that the ex-army Captain was accustomed to command and unwilling to accept instructions from mere civilians. Most especially, he did not enjoy paying Excise duty. Pavey explained that because Brackla was aged for longer than other whiskies, the Captain lost more than others to the ‘Angel’s Share’ and would regularly attempt to evade paying duty on the ‘missing’ spirit. The Exciseman refused to turn a blind eye: the Captain was fined heavily on several occasions for his serious breaches of the regulations. According to Pavey, the vengeful Captain became ‘haughty, imperious and tyrannical’. He forbade his workers from having dealings with the Exciseman and his young family, and he took legal action on some petty issue. Pavey won the case but only after spending a small fortune on legal fees. So who was this ogre? Royal Brackla became the first distillery to be awarded a Royal Warrant by King William IV, which was renwed in 1838 by Queen Victoria. William Fraser was born in Brackla in 1767. At the age of 16 he enlisted in the army and went to India. He served with the 73rd (Highland) Regiment of Foot in the Third Mysore War against the fearsome rocket-launching armies of Tipu Sultan. Although wounded at the Battle of Seringapatam in 1792 and again at the siege of French-held Pondicherry the following year, he participated in the British invasion of the Dutch colonies in Ceylon (Sri Lanka) in 1795-96. After 14 years in India, Fraser was forced by ill health to return to Britain. He was promoted to the rank of Captain in the 92nd (Gordon Highlanders) and then in 1805 secured a transfer to a Royal Veteran Battalion stationed at Fort George, near his birthplace. He married that year and, near the end of the Napoleonic Wars, in 1814, he retired on a full military pension to live and farm at Brackla. The Captain was concerned that farmers on his estate were turning to illicit whisky distillers to find buyers for their barley. The passing of the Small Stills Act in 1816, however, encouraged many local landowners to set up small licensed distilleries and the Captain joined four other men to build one at Brackla. They struggled to compete with the whisky smugglers and his partners gave up after two years of heavy financial losses. The stubborn Captain continued alone. The Brackla distillery business was turned around by what might, today, be called clever marketing. Accepting that there was little demand for his product locally, the Captain appointed an agent in Aberdeen to take orders from local dealers and families. The orders were shipped to the city from Inverness twice a week – an early example of a direct mail order business. Subsequently, agents were appointed in Dundee and other Scottish towns and cities. The Captain looked even further afield. Inverness was one of the few Scottish ports which was permitted at the time to ship whisky to London. In 1826 the Captain sent his first consignment of 900 gallons of Brackla to the capital, where he had entered into an exclusive agency agreement with an enterprising wine and spirit merchant, Henry Brett. Brackla was soon the best-known whisky in the capital. No one knows how the Captain obtained the first Royal Warrant for a Scotch whisky. Perhaps it was through the good offices of his friends in London, or some contact from his soldiering days. In 1833, however, King William IV granted the Captain the privilege to ‘use the Royal Arms on everything connected with his distillery, as a mark of approbation for the complete success which has attended his efforts to produce Highland whisky by licensed distillation…’. An extract from Royal Brackla’s barley book showing the distillery buying the good Captain’s barley in the 19th century. The Captain immediately renamed his distillery Royal Brackla, and Brett placed a series of advertisements in the leading London newspapers offering to supply Londoners with ‘The King’s Own Whisky’. The effervescent Brett informed his customers that ‘Every North Briton is aware that Malt Whisky attains the peculiar mellowness, which constitutes its chief excellence, only in casks; we have therefore determined not to bottle largely, but to draw the Royal Brackla whisky from the original Highland puncheons’. He claimed Royal Brackla was ‘perhaps the only Malt Spirit which proves alike congenial to the palate and constitution of connoisseurs of every country! It is peat-flavoured, but far from rank; strong, but not fiery.’ If only modern tasting notes were so concise. The whisky was sold at £1 per gallon or in bottles at £2 and 4 shillings (£2.20) per dozen. The price was right, and the Captain prospered. Then, in 1838, the young Queen Victoria granted the distiller her own Royal Warrant. By the time the Captain died in 1846, Royal Brackla was famous throughout Britain. So, was this pioneering distiller really such a monster? Even Exciseman Pavey admitted his old foe was warm hearted and generous to his friends and employees. Newspaper reports reveal he was a popular chairman of many local dinners and celebrations, characterised as ‘an excellent neighbour and a kind-hearted country gentleman’. Pavey, meanwhile, confessed that he had himself earned a reputation as inflexible when serving as the Exciseman in Campbeltown in 1834, where he ‘was blinded somewhat by official zeal’. He had never wanted to go to Brackla in the first place, to live in a remote, Gaelic-speaking Highland community. A suspect witness? The evidence suggests that the Captain got a bum rap from the pettifogging Exciseman. William Fraser of Royal Brackla is surely one of the unsung heroes of Scotch whisky history. Albeit a very grumpy one. Two single malts, two single grains, two blended malts: a mixed bag of new whisky releases.